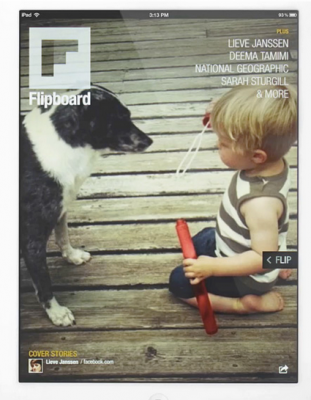 In case you don’t know, Flipboard is a newsreader app. I’ve had it on my iPhone for some time now, loving the way that it pools together stories from a range of well-known media outlets and presents them to me using a “flip” interface that’s both intuitive and satisfying to use. When you first run Flipboard, it asks you for your interests. My personal choices include news, UK news, technology, food, and travel but there’s plenty more to choose from including celebrity news, sport, TV and fashion. Flipboard can also link to Facebook, Twitter and various other social sites, presenting friends’ updates alongside the other content. After several months of use, Flipboard became one of those apps guaranteed to survive every one of my occasional iPhone app clear-outs. So when I recently purchased my first iPad, it was a given that it would be one of the first apps I would install and check out on the new device. It turns out that the difference between brilliant and perfect is an increase in screen real estate. While Flipboard was great when it showed me one story at a time, it now spreads out mixed media (including video) across iPad “pages,” making the experience just like reading a futuristic newspaper. I’m able to scan the headlines, and then drill down into the stories that interest me. 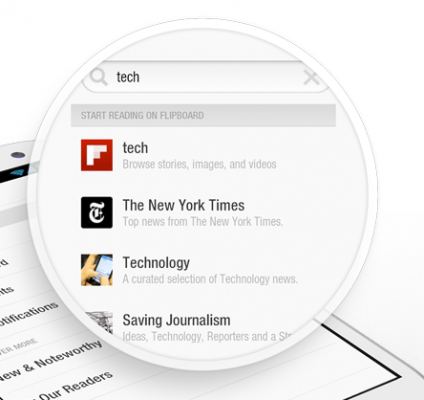 Creating a Flipboard account is free and very easy. In my case I simply linked it to Facebook – a true “one tap” signup. 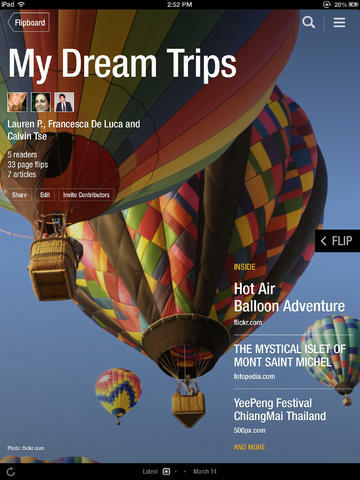 Once you have an account you can “favourite” stories that interest you and create your own Flipboard magazines. I’m not sure I will find a need for this feature but it’s good to know it’s there. For me, it’s quite enough to have access to all the news stories in a format that is so much like a newspaper. Picking up my iPad and “reading Flipboard” at the end of a working day now brings me that familiar sense of “it’s time to relax and read the paper.” In fact, I often read far enough back to meet the feed of stories that I finished the previous day. Still, given that Flipboard itself is completely free (a wonder in itself), perhaps I should just pay out for a subscription. After all, with Flipboard in my life, I can’t imagine a time when I’m ever again going to feel the need to pay for a newspaper. Even though I’m an “IT guy,” I’ve never been a believer in “technology for the sake of technology.” Before I buy a device, I have to understand how it’s going to fit in with my life and be sure I’m going to use it. I’ve seen far too many clients become hooked on buying shiny gadgets that never get properly exploited. As such, it’s taken a very long time to convince myself that I really need an iPad. There’s been one in the house before, as my wife had one as part of her job, so I’ve hardly been blind to their desirability, but with an iPhone and MacBook Pro already in my possession, I needed some strong justification. It came in the form of my signing up to do a degree course via distance learning. The course requires me to read a lot of online content, which is ergonomically awkward on a laptop and impractical on a smartphone. So I finally had the excuse I needed, and went out and purchased a 32GB iPad Mini. Let’s face it, nobody’s ever disappointed when they take home a box containing new Apple hardware, and the iPad Mini is no different. However, I didn’t fawn over the sleek silver back for long, as I placed it straight into a protective rear cover and clipped on Apple’s own magnetic cover and stand combo. How the device worked was obviously no surprise either; we’re essentially talking about a big iPhone that’s not a phone, but I was pleased that I didn’t feel myself badly missing a retina display. However, I did notice (and continue to notice) that the touch control isn’t quite as precise as that on my iPhone. It’s not bad at all, but I do sometimes find it hard to tap small “x” icons, especially when they’re near the top right corner of the screen. As I said above, I was far more interested to find how the iPad slotted into my life than in investigating every feature available to me. After all, most of the functionality is already available on my iPhone. The first point to make is that it’s given me a greater sense of separation between my working day and my evening. As I work from home, it’s easy to find myself still on my MacBook as darkness falls, in a strange kind of half work / half play limbo. Now I have the iPad, I’m more likely to close the laptop when the work is done, and switch to the iPad. This is a good thing, as it’s a far more sociable way to use technology. As part of this, I took the decision not to sync my email accounts and calendars with the iPad, supporting its role as a leisure and study device and not a business device. Despite the separation, the iPad is such a pleasure to use, it’s kept me up long into the night on a couple of occasions: once simply playing around with apps, including DJ software, games and music tools, and the other reading a recommended text for my university course that I found instantly available to me via iBooks. 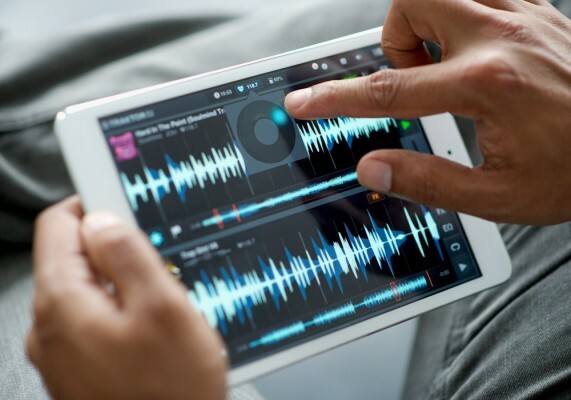 I’ve also enjoyed being able to take the Traktor DJ app to a house party, resulting in a usable casual DJ setup, all in a package weighing 308 grams. I’ll be honest: I really should have splashed out on an iPad sooner. There really is room for another gadget between laptop and smartphone, even if both of the other gadgets can technically fulfill every purpose. The beauty of the iPad Mini is in its form factor. When we had a full size iPad in the house, I rarely used it for prolonged Web browsing as it simply wasn’t that comfortable. 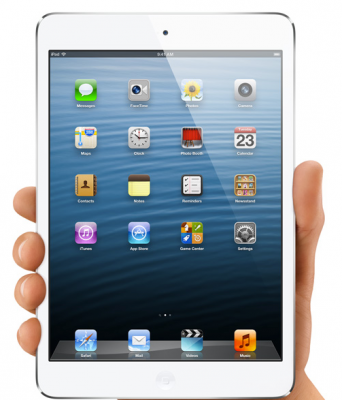 The iPad Mini is perfect in this respect and very pleasing to use, even with just one hand. If you’re struggling to justify buying an iPad, it’s time to give in. I promise you won’t regret it. Much has changed since then, obviously. Easy software downloads have obliterated the last of the cover disks, and the printed magazine industry itself is struggling as a result of people consuming information on their PCs and tablets rather than in printed form. Many long-standing magazines have folded (pardon the pun), and many more have switched from monthly to quarterly production. For me, however, the lure of printed magazines has remained strong. As I now live in Portugal, English-language magazines are hard to come by and are rather expensive, but every trip to the UK has me visiting the airport newsagent for a stack of magazines to bring home, including titles such as BBC Good Food, Wired, and Mac Format. Earlier this week, everything changed, as I finally gave into temptation and purchased an iPad. The ability to read my favorite titles on a sensibly-sized screen was one of the main attractions. One of the first things I did was download the Zinio magazine app. I had used this before on both my Mac and iPhone, but found the experience far from pleasurable on those platforms. 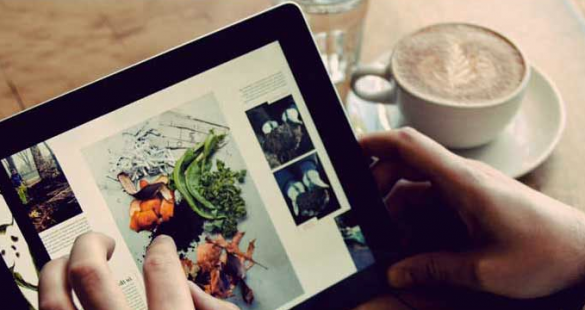 It’s not comfortable or relaxing to read from a laptop screen, and magazine reading on an iPhone involves far too much pinching, zooming, and squinting. Furthermore, I don’t particularly fancy leaving the fate of either of these expensive gadgets to the bath or the beach. Zinio on the iPad was everything I had hoped for. I could comfortably read a whole page without zooming, and the ability to switch to a pure-text display for long articles was very convenient. Within hours of unpacking my iPad, I had devoured the latest issue of Mac Life, as well as several other digital magazines that I purchased impulsively. I then switched to Apple’s Newsstand app and downloaded Wired, another title I greatly enjoy in its paper form, but it’s not really quite right to describe the electronic version of Wired as a magazine; it’s more of an interactive experience, with embedded video clips, animations and mixed-media advertising. I was impressed, but before too long, I found myself wishing I was curled up with the paper copy instead. The simple fact was that the overuse of clever features made the experience more like playing a game than reading a periodical. It wasn’t instantly clear how I was meant to use all of the gestures and such, and as a result I found the experience more tiring than relaxing, especially when I reached a page which appeared to have a glitch that interrupted my reading. I’m truly glad that I have instant access to all of my favorite magazines, but I’m not at all convinced that I want magazines presented to me in a newfangled interactive way. While I’ve no doubt that this works wonderfully for interactive textbooks, I simply like to sit and read my magazines from cover to cover, without having to work out how and where to press the screen of my iPad. So, while magazine reading will surely be something my iPad is used for much of the time, I’ll still be visiting the newsagents and leaving with a carrier bag full of magazines when I get the opportunity, and I won’t have to worry about dropping them in the bathtub. The Budget iPhone: A Risk for Apple? While there’s nothing to guarantee that there’s any truth to the rumors, when the web-based chatter reaches this volume, there’s usually some level of fact in play. Prior to the launch of the iPhone 5, the bulk of the leaked information proved to be right, so it’s not unreasonable to assume that some of the reports that we’ve heard about the budget iPhone are correct. Let’s assume that most of the rumors we’ve heard are true. What other assumptions can we hypothetically make about a new budget iPhone? Here’s what we could expect. It will run iOS 7, because Apple’s hardly going to release something new that runs an old operating system, obviously. 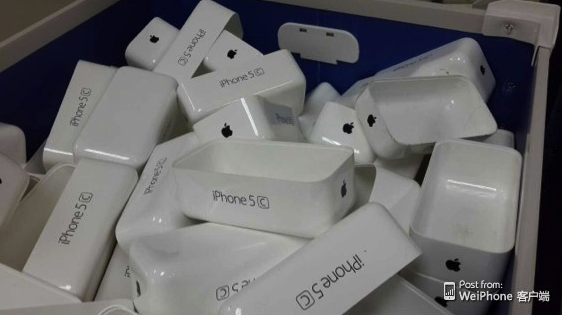 Storage options will be similar, although there may be a return of the low-capacity 8GB model that’s been dropped since the release of the 4S. 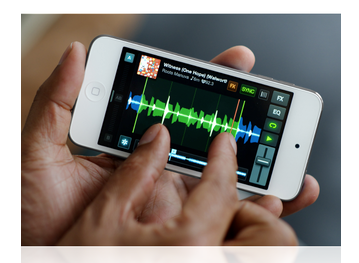 It will have the same aspect ratio as the iPhone 5, although it may not be a retina display. As we’re now playing the assumption game, let’s also assume that the cost of the budget iPhone is roughly half the cost of an iPhone 5. (A SIM-free 16GB iPhone 5 is $649 in the US right now, making our hypothetical budget iPhone cost around $325, which is broadly in line with internet rumor). What will you get for paying double the price? So what’s my problem with all of this? My main problem is that aside from the points above, consumers still get an iPhone after paying half the price. Most everyday consumers don’t even know how many megapixels their camera has, nor do they probably care. Furthermore, the lack of a retina display will most likely have no bearing on sales, as the lower-quality display has done nothing to stop the iPad Mini selling by the boatload. We’re then left with the materials. The materials that have made previous iPhones seem luxurious and desirable are the same materials that result in expensive repair bills from disastrous smashed shells and screen incidents. With this in mind, I have to wonder if, when I go to buy my next iPhone, I’ll decide to buy one that costs half as much. More importantly, it will still only cost half as much when I have to replace or repair it. I welcome the possible release of a low-cost iPhone. I also fully appreciate that there will always be plenty of people who simply have to have Apple’s flagship phone. This is, of course, made easier for consumers in countries where handsets are network-subsidised. Google’s corporate motto is “don’t be evil.” When this was unveiled in 1999 / 2000 (attribution claims vary), it was seen as something of a dig at various large companies and the way they operate. Zooming forward to the present day, I find myself wondering if Google are beginning to lose sight of this ethos and become a little drunk on their own power. I run a number of blogs. One of them has, over the past few years, become rather successful. Now, I don’t mean “earn a fortune, quit my job” successful, but successful enough to attract advertisers, gain loyal readers running into the thousands, win a couple of small awards, and earn me enough money to make the time I spend on it worthwhile. So, why am I moaning about the Google dance? Well, it started a few months ago, when I began to notice my unique visitors dropping like a stone. I had a chat with an “industry” friend, and he pointed me in the direction of a very interesting article about how Google is slowly “killing off” organic search. According to the article, there’s now less and less space on a typical Google search page dedicated to organic results, and more and more dedicated to revenue-generating Google products. The examples in the article include a search for “auto mechanic” where only 13% of screen real estate on a 13” Macbook Air ended up displaying natural search results. A search for “Italian Food” on an iPhone showed NO natural results whatsoever on the first screen (barring one from Google-owned Zagat) and required a scroll through four pages of information before any truly natural results appeared at all. So how does this affect independent bloggers? In my case, my blog has been at the top of Google’s results for a number of relevant search terms for several years. Now it has dropped down, typically to fourth or fifth place. So why has this happened? Well, it’s clearly due to one of the recent algorithm updates, but looking at the sites that are now on top reveals little. While one or two may arguably have more “authority,” some are small commercial companies appearing seemingly at random, which tells me that despite Google’s punishing algorithm updates, some sites are still manipulating their rankings with SEO techniques and are slipping through the net. After spending years creating good content and building readers, Google moves the goalposts, resulting in far fewer people finding my site. While I know this sounds like “sour grapes,” I’d be less bitter if I truly believed that all the results that have pushed me from the top deserved to be there. I’d find it easier to accept the situation if some didn’t contain vastly out of date content that (personal bias aside) simply doesn’t deserve to be there. The more I think about it, the more it seems that increasingly, the only way to ensure people consistently find you on Google is to pay Google. Even if you’re doing well in the organic results right now, the next algorithm change may plunge you into obscurity, especially when Google’s page layouts now mean that even being on the first page of the natural results doesn’t mean anyone will see you without lots of scrolling. Google built its popularity on being fast, clear and fair. It would be a terrible shame if that “don’t be evil” slogan came back to bite it. According to a recent study, the average smartphone user has 41 apps on their device. It interests me to know how many of these are in regular use. While I have a small set of core apps that never move from my home screen, I tend to go through phases with others. Several things from last year, for example, have fallen out of favor and been deleted. Examples include Words with Friends (there’s only so much Scrabble one can play), iQuit (sadly my giving up smoking attempt failed), and Instapaper (I just didn’t use it enough). Meanwhile though, other apps have stepped in to take their place and keep me glued to my device for many a waking hour. In this article I list three that have been enhancing my life in recent months. These days, if I get bored, I go on Flipboard. This simple app aggregates news reports in various subject areas, giving you a brief overview of a story, courtesy of its pleasing “flip” interface, with an easy way to drill down to the full story if it’s of interest. It’s something akin to StumbleUpon crossed with Twitter crossed with a standard news app, and if you’re a news junkie, it will occupy hours of your time. It’s available for Android too. I was recently fortunate enough to enjoy a holiday in the USA where I visited New York and Florida. I downloaded various guidebook-style apps before my vacation, but TripAdvisor’s free offering was the one the really enhanced our trip. Its best feature is its ability to use the iPhone’s basic compass and GPS functionality to point you at anything in the guide. Want to find your way from Midtown New York to Downtown New York, walking via Chinatown – no problem – you can navigate the streets like a pro. It does all this offline from a downloaded guide, meaning it works well enough with data roaming switched off. Guides are currently available for over 80 cities worldwide. Finding yourself somewhere new without getting lost gives you a lot more time to see the things you want to. I’ll be using this app in every new place I visit. I had to include a game, and for someone with a short attention span, Subway Surfers has stayed on my home screen list for a surprisingly long time. It’s essentially an “endless running” game, but one that runs at a rather more sedate pace than the likes of the popular Temple Run. There’s also something decidedly retro about it that appeals to the 80s gamer in me. 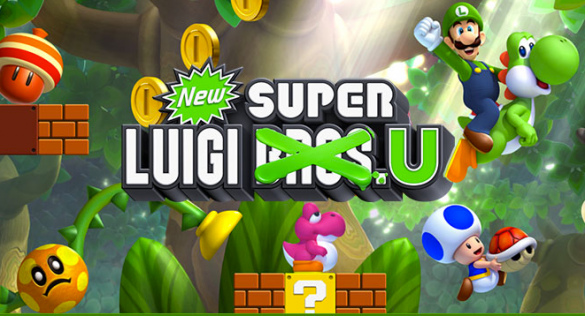 Also, although it’s a freemium game where you can purchase power-ups and such, it never makes you feel like you need to spend anything to enjoy it properly – which just seems…kind and fair, which is a good thing. My apps come and go, but the list above consists of three that I think are destined to be “keepers.” I strongly recommend you check them out. In recent times, the above three phrases are heard frequently emanating from various rooms in our apartment, where my wife and I both work as full-time freelancers. Skype is an essential part of both of our respective businesses. We do work for clients in various countries, and being able to interact with them by phone at a low, predictable cost is essential if we are to live and work where we do – in a sunny apartment just minutes from the coast of Portugal’s Algarve. Skype is, on the face of it, perfect for us. It provides us with London telephone numbers, which shield our physical location and make it inexpensive for UK clients to contact us. Skype also offers a range of all-inclusive call packages allowing us to call clients abroad without bankrupting ourselves. 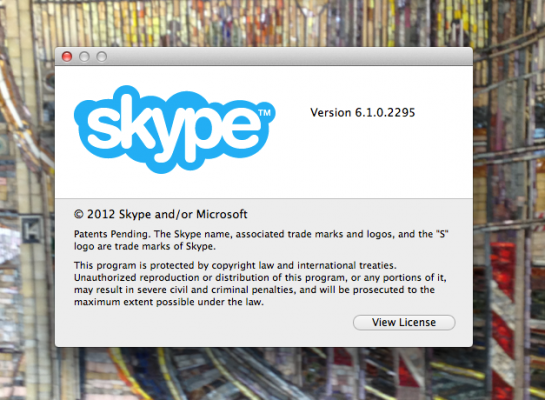 Skype – Not what is once was? Or at least that’s the idea. For reasons unknown to us, the incidence of poor quality Skype calls seems to be on the increase. Now, as a techie, I know that we have a good, fast broadband connection with low latency. I also know that nothing has changed at our end since the days when we could use Skype with only very rare quality problems. Yet, for some reason, it now seems that (more often than not), people are having trouble hearing us. Usually, this only happens for 10 seconds or so, before a high quality connection returns, but in the meantime we have to go through the whole “can you hear me now?” routine. When I’m chatting with my mother in the UK, this is acceptable (while still infuriating). After all, I’m able, thanks to Skype, to spend hours talking to her at a very low price. It’s not, however, good enough when working with clients, especially prospective new clients. Sometimes it takes new clients some convincing that our geographical location is irrelevant. If our first few phone conversations keep cutting out, it doesn’t really create a good initial impression. So, despite a long and happy relationship with Skype, I’ve felt forced to start investigating alternative Voice over IP services, and it’s a shame because when Skype works, it works incredibly well. Sadly though, until I find a suitable replacement, I’ve had to switch back to a very old-fashioned strategy: If I’m calling an important client, I walk into the study and pick up the landline phone. The bills are unwelcome, but so too would be the loss of a paying customer. Your iPhone or iPad warranty: check the fine print! At Christmas, I bought my wife an iPhone as a gift. I live in Portugal, but purchased the device (unlocked and SIM-free) in a London Apple store during a work trip to the UK. There is an Apple store in Lisbon, Portugal’s capital, but it is three hours drive from our home, so buying the phone in London made sense. Or so I thought at the time. Six weeks later, my wife’s iPhone developed a fault. The backlight decided to periodically die, for anything from two minutes to several hours. Despite trying all manner of resets and other things the problem persisted. Apple may restrict warranty service for iPhone and iPad to the country where Apple or its Authorized Distributors originally sold the Apple Product. Now, this was an unpleasant surprise. If I lived anywhere Lisbon, I would have been happy to visit the Apple store there and argue my case, but as I previously mentioned, we live three hours away. The return cost of petrol, tolls and parking runs to about €150. Add in a day’s loss of earnings, and we reach a sum in excess of the cost of Apple’s flagship phone. Of course, we could try to phone Apple and resolve this via a “send in” repair, but sadly we’ve been here before when needing to replace the faulty power adaptor for my MacBook Pro (which I, in fact, purchased in Portugal). A combination of language barrier problems and Apple being incapable of realising that people may sometimes buy their devices in one country and use them in another ended up with us giving in after hours on the phone, and arranging for our replacement to be sent to the UK to be shipped onwards by a friend. In the case of the iPhone, life just seemed too short to waste more of it on the phone arguing – especially when Apple’s fine print says that they’re basically not interested if your iPhone decides to go wrong in a different country from whence you purchased it. So, while I know I could waste hours arguing about this and eventually reach a resolution, I’ve instead decided to give in to the fine print and take the phone in when I’m next in the UK. Meanwhile, my wife will tolerate an expensive device that becomes unusable at random intervals. As ever, I continue to love using Apple products, but I’ll be asking a lot more questions before I hand over any cash for the next one.